Lighthouses have been protecting ships at sea since earliest times. From fires to gas lamps to electric lights, these warning signals have alerted sailors to reefs, heavy fog, and other dangerous conditions. Once operated by keepers who lived in or near the lighthouse, these beautiful structures are now mostly run automatically. Their color, iconic shapes, and intriguing lore make lighthouses a favorite site along the shoreline. If you live near the water, celebrate today by visiting a local lighthouse museum. If you are more landlocked, do a little research or read a good book about lighthouses. Copyright Lynd Ward, 1942. Courtesy of Houghton, Mifflin Harcourt Books for Young Readers. He opened the side door with a key from his jangling ring and “climbed its steep and winding stairs, up, up, up, to the very top. He took off the thick white cap that let it sleep by day.” He turned on the gas, and in a few minutes the lighthouse began to speak. “Flash! Flash! Flash! Look out! Watch me! Danger, danger, danger! Watch my rocks!” It felt very proud, knowing that the boats needed it to stay safe. Copyright Lynd Ward, 1042. 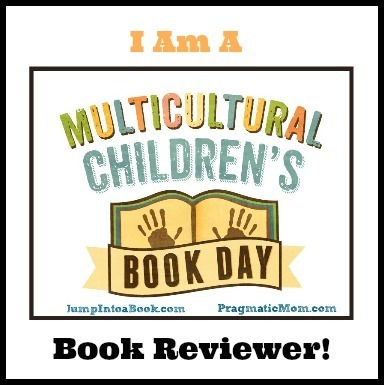 Courtesy of Houghton, Mifflin Harcourt Books for Young Readers. When a heavy fog descended, the keeper came and wound a big clock inside the lighthouse. The clock ran an iron bell that rang to warn the sailors who couldn’t see the lighthouse flashing. With two voices, the lighthouse felt even more proud. “I AM MASTER OF THE RIVER” it decided. But one day construction workers arrived. They dug and dug and then began building enormous girders that reached high into the sky. Then the men attached thin silver cables to the structure. When the cables were in place, the men celebrated. The little lighthouse didn’t know what was happening. Then one night a great, bright light shown from the top of one of the bridge’s towers. “Flash! Turn! Flash!” it said in a loud voice. The lighthouse thought it was not needed anymore. Its light was so little while the bridge’s was so big. The lighthouse worried that the keeper would forget to turn its light on or that it would even be torn down. That night as it got darker and darker, the keeper did not come. The lighthouse felt strange. Copyright Lynd Ward, 1942, Courtesy of Houghton, Mifflin, Harcourt Books for Young Readers. Hildegarde H. Swift’s classic story of the Hudson River lighthouse will enchant readers. The little red lighthouse makes a charming narrator for its tale that teaches kids about the importance of lighthouses while also showing them that even though one may be little, they can still have a profound effect on those around them. The pride and worries of the lighthouse will resonate with young readers, and they will cheer when the light is turned back on and the lighthouse regains its proper place. Swift’s lyrical language will keep children riveted to this fictionalized account of a historical event. Lynd Ward’s evocative illustrations, rendered in red, blue, black, and white, are both strong and whimsical and seem as fresh today as they were when the book was first published. Features on the ships, lighthouse, and bridge make organic faces, personalizing these characters for children, while Ward’s depiction of the storm as a specter grasping at ships is striking and emphasizes the importance of the lighthouse. 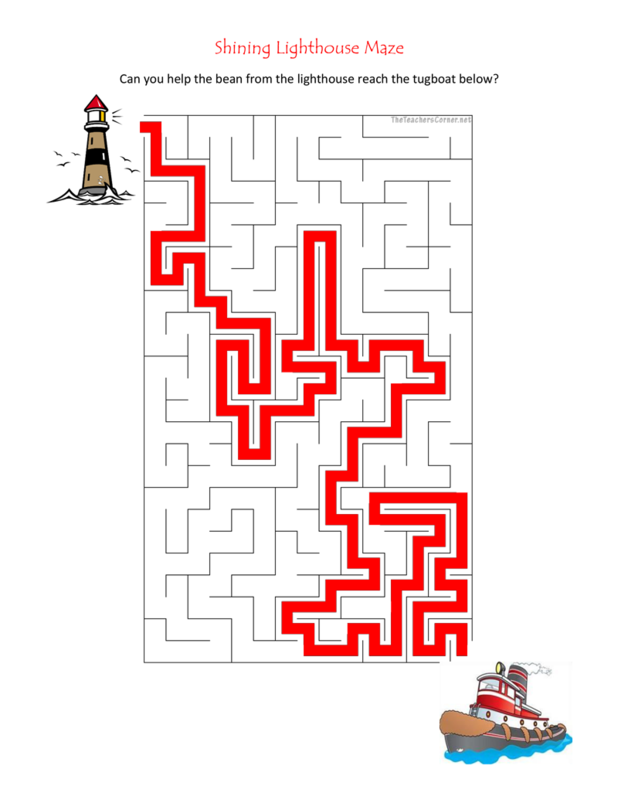 The Little Red Lighthouse and the Great Gray Bridge is a multi-layered story for all readers. Children interested in lighthouses, bridges, boats, and construction will be especially drawn to this book. Lighthouses protect ships from rocks, fog, and other dangers. 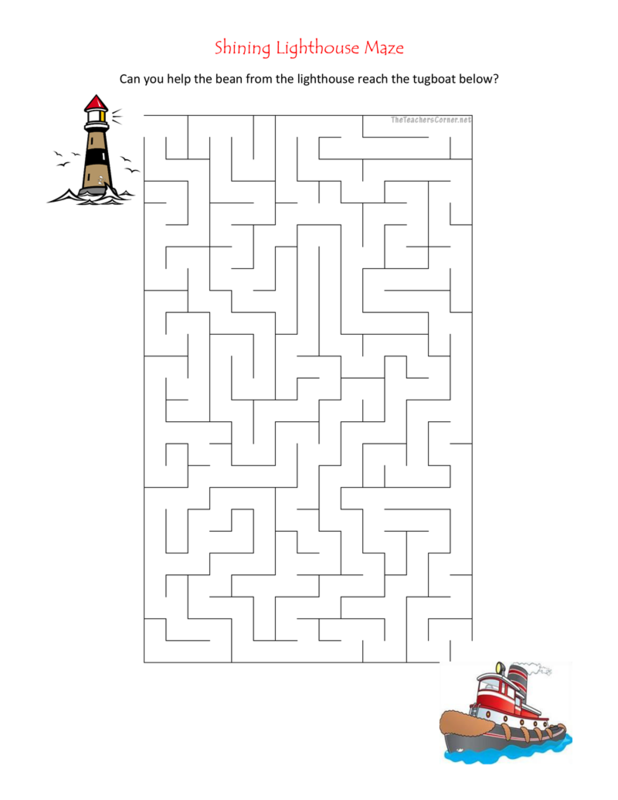 Can you help the beam from the lighthouse reach the tugboat that is approaching in this printable Shining Lighthouse Maze? Here’s the Solution.